An Aquarena Center aquarist readies a new aquatic species exhibit in Discovery Hall. Destined to be a centerpiece of technology enhancements now underway at Aquarena Center, the new aquarium will be the first education exhibit to greet visitors as they enter the newly renovated Discovery Hall. 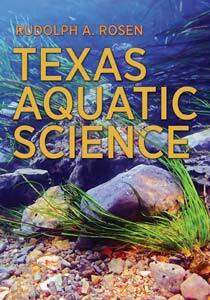 Aquarena Center is part of The Meadows Center for Water and the Environment at Texas State University, San Marcos. The Texas Pioneer Foundation provided a generous grant to purchase and install the aquarium in Aquarena Center. The Meadows Center is playing an ever increasing role in providing innovative technology-enhanced education about water to young and old. 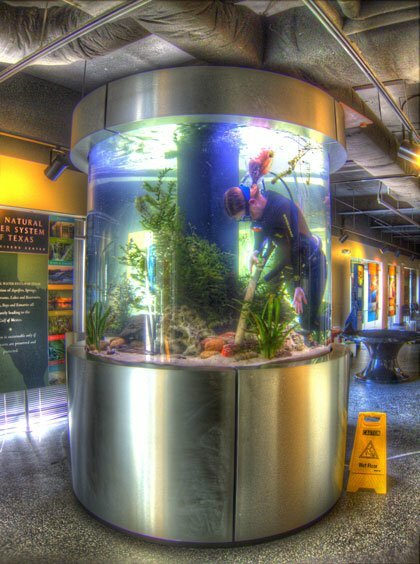 Aquariums in Discovery Hall showcase the underwater life of San Marcos Springs, home to eight endangered aquatic species. Along with other new interactive and mobile device friendly enhancements, the new aquarium ensures an unforgettable education experience to all who enter the Hall. Work at Aquarena is part of H2O’s watershed-wide educational effort from headwaters to ocean.